Before workers could move forward on the extensive Rotunda restoration, they had to fix a long-standing problem: The leaky roof. According to senior historic preservation planner Brian Hogg (Col ’83), the Rotunda roof, in all of its incarnations, had leaked from day one. The original tin-coated shingles naturally oxidized to a chalky white, but because the roof leaked so badly, it soon started to turn other, less-appealing colors. The roof was painted with a red oxide paint and later covered with black tar. After the 1895 fire destroyed the original dome, architect Stanford White commissioned a fireproof dome constructed using the Gustavino tile method—a series of self-supporting arches created by interlocking terra-cotta tiles—and covered with copper, with plans to paint it white. But the copper was never painted or treated; as it corroded, it turned a chalky light green color. The 1975 renovation replaced White’s copper roof (but not the Gustavino tile) with one made of steel panels coated in a tin-lead alloy. But still the roof leaked. 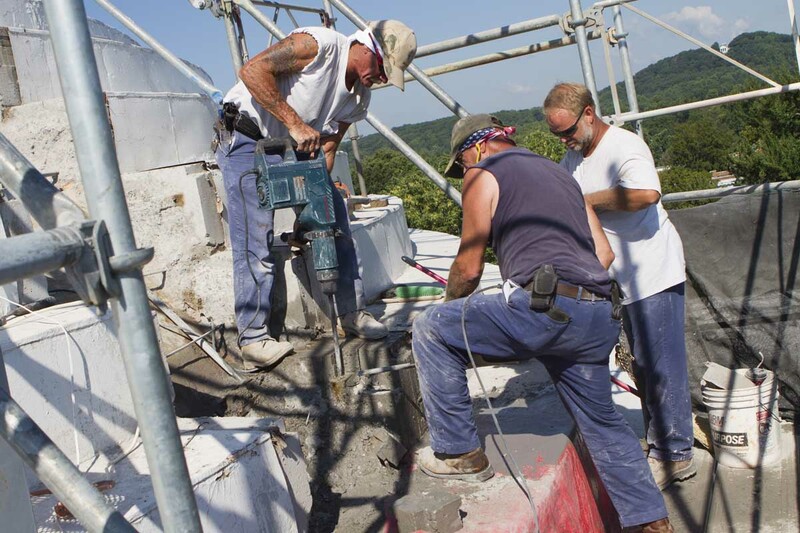 During the recent renovation, roofers from W.A. Lynch Roofing Co. of Charlottesville replaced the steel roofing with white-painted copper roofing, as White intended in 1898. They applied more than 4,000 pieces of copper, weighing a total of six tons, to the steep-sloped, stepped dome. They also made repairs to the Gustavino tile system and to rusted tension rings that “help contain the thrust of the dome so that the walls don’t explode,” Hogg says. 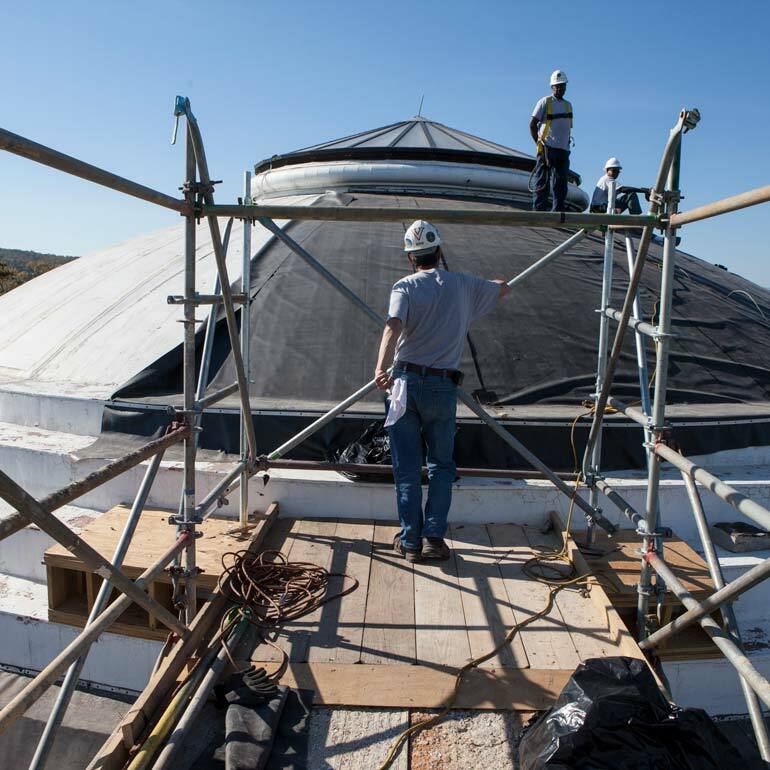 As they worked, crews found small skylights and pieces of tile from the Stanford White-designed dome, and soda bottles and beer cans left behind by workers renovating the Rotunda in the 1970s. Painting the roof was no small task. The prepping, priming and painting could be completed only in absolutely dry conditions in temperatures ranging from 60 to 100 degrees Fahrenheit and 5 degrees above the dew point. After lightly sanding the copper and applying a primer coat, painters E. Caligari & Son of Norfolk tackled the painting in sections, starting with the top of the dome and moving down. The paint job is expected to last 20 to 30 years. And no one expects the roof to leak any time soon.